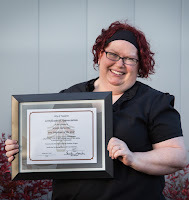 Aimee Meuchel, Teen Librarian for the Tualatin Public Library, was selected as Tualatin’s 2015 Employee of the Year. After being named Tualatin’s first Teen Librarian in 2008, Aimee was instrumental in forming the Teen Library Committee. Through the Teen Library Committee, teens help Aimee and other library staff to plan and deliver programs for teens, children and families. Teens develop leadership, planning, and organizational skills through their work with the committee. She also developed and leads the Summer Teen Library program. Aimee’s approachability, genuineness, creativity, care, and concern for the teens she mentors is what makes the Library Teen Room “the place to be”. Aimee was honored by the Oregon Young Adult Network at the 2015 Oregon Library Association Conference. The “You’re Excellent” Award was given in recognition for her positive and significant contribution to teens in Oregon libraries. The Tualatin City Council will present Aimee with a proclamation at their February 22, 2016 business meeting.